Just click this link to enter our $5,000 viral marketing contest. Enter your Twitter name & follow the instructions. Hundreds of people have already entered and your time is running out… what are you waiting for? Go get your links already! If you’d like more information on the prizes or how the current contest works, you head over here and view the contest prizes and details. It’s so easy you can even win just by commenting on this blog post! The Countdown Begins! I agree with Randy Beard, I have used more of the marketing skills I have been studying on the promotion of this contest than I have ever used on my own websites. I good lesson was learned. Thank you Bill. 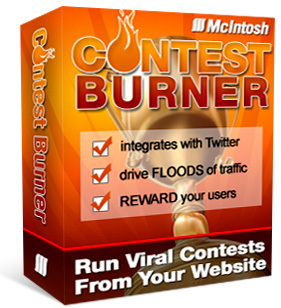 Even if I don’t win I will end up with both the Contestburner plugin and a lot of experience on Twitter, YouTube and blogging. Looks like were down to the wire on this one! I am tweeting as much as I can without being a spammer like some I see…lol Anyway here is to everyone who is doing such a great job with this contest. I am posting this exciting product to stimulate Mega Traffic! Can’t wait for the re-launch. Those of us who had a taste of ContestBurner beta version are chomping at the bit waiting for the launch of the full package!